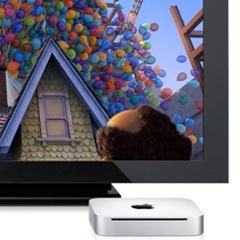 Today Apple introduced a even smaller version of the Mac called the Mac mini. It comes loaded with an HDMI port, an SD card reader and much more graphics and processing power all within a small form factor. It only meansures 1.4 inches tall enclosed in an aluminium case. It is priced to start at $699 and comes with a 2GB Ram with a max of 8GB and a 320 GB haard disk with a max of 500 GB. Not just that its power graphics are something to look at. Powered by a NVIDIA GeForce 320M GPU which is usually found in Macbooks and Mac desktops. There is a choice between the processors. You can choose between a 2.4 GHz Intel Core 2 Duo processor and a 2.66 GHz version of the same. If you thought the small form factor did not allow an DVD rom disk, think again! 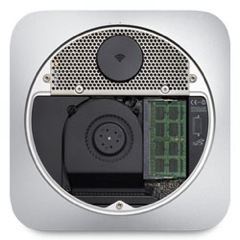 It is equipped with an Apple 8X SuperDrive to burn/read DVDs and CDs. There is a mini server model available which drops the super drive and lets you have two 500 GB hard disk drives and a 4GB of RAM for $999. The small form factor really amazes me, it has a power brick built into it so all you need is a power cord. Weighing about 3 pounds with a panel access below it to upgrade the RAM. With the HDMI port it could be connected directly to any HDTV for a high def picture. It also can be connected to a standard Apple display. Apart from these there are a standard four USB 2.0 ports and a FireWire 800 port, an SD card slot, built in Wi-Fi, bluetooth and an ethernet port. For another $19 you get an Apple remote for the device which can make it into a real home theater system.